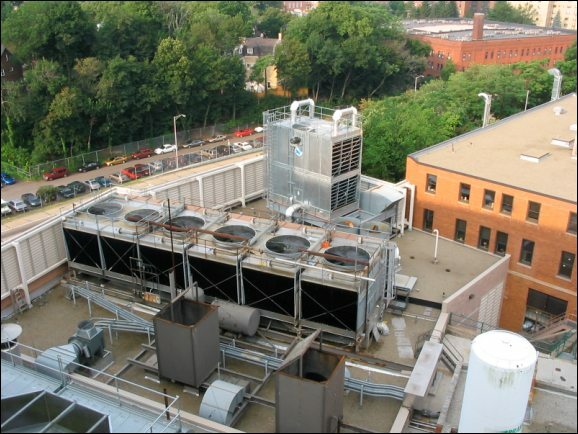 UPMC Hospital in Pittsburgh, Pennsylvania has installed large cooling tower systems to provide chilled water for their extensive hospital facilities. However, residential areas are near the hospital, and the hospital received complaints about cooling tower noise shortly after installation of the additional cells. UPMC contacted David Coate Consulting (DCC) to assess the severity of the noise problem and to provide solutions. Figure 1 shows measured cooling tower noise at a residence near the hospital. DCC conducted these measurements in order to determine the relative noise contributions between the existing Marley cooling towers and the new BAC towers. In addition, these measurements show the effect of fan speed on noise level and for comparison with ambient noise levels. These noise measurements show that the new BAC towers were the cause of the noise problem and 5 to 10 dBA attenuation would be required to restore the noise environment to its previous state. DCC evaluated a number of mitigation options including low-noise fans, noise barriers, adding more cells (and reducing fan speed), intake and discharge attenuators, as well as building sound insulation treatments. The Marley towers had low-noise fans installed in 1991 which alleviated a similar noise situation. 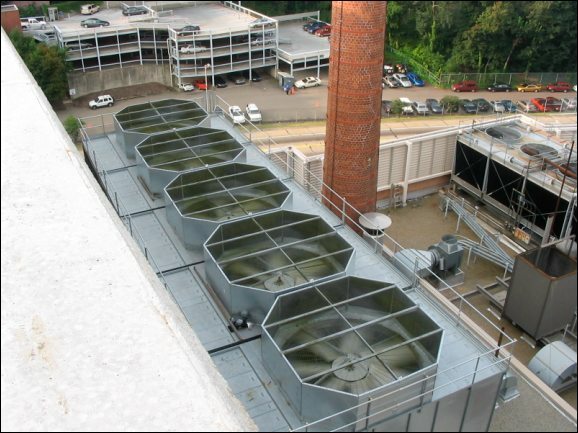 Figure 2 shows the Marley cooling towers. DCC found that the BAC fans produced noise levels proportional to 30logS (S=fan speed). However, the fans are currently operating at a fairly low speed and therefore further improvements with low-noise fans and speed reductions would be limited. Acoustical analyses showed that a noise barrier installed on the top of the tower would reduce noise levels by about 5 dBA. Because of the relatively low cost of this option, DCC recommended the installation of a noise barrier. Sound reflections could limit the performance of the noise barrier so DCC will conduct a test using temporary fiberglass batt insulation affixed to the inside face of the noise barrier. These noise measurements will verify the acoustical performance of the noise barrier and determine whether or not a permanent outdoor sound absorbing treatment is needed.